Watch Book of Mormon Central's new video on one of the best examples of archaeological evidence we have for the Book of Mormon. This video is part of a new and exciting video initiative by Book of Mormon Central. This particular video has brought together what we know about the Book of Mormon place of "Nahom." As it turns out, archaeologists have been able to find and positively identify Nahom in southern Arabia. The site at Nahom even dates back to Lehi's time period. Stephen Smoot at Book of Mormon Central walks viewers through the discovery of Nahom and what it means for Book of Mormon evidence. When Ishmael passed away on their journey, Nephi implied that the place where they buried Ishmael already had a name. If the place was called Nahom back in Lehi's time, you'd expect to be able to find it in the archaeological record, and that's exactly what we find in southern Arabia, along Lehi's trail. 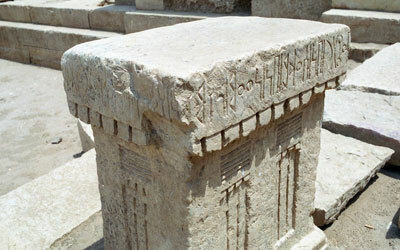 An altar from Nehem with the inscription "NHM"
In southwestern Arabia, one can find a small settlement called Nehem. At first, people were unsure if "Nehem" could really be the same place as "Nahom" mentioned in the Book of Mormon. However, in 1997, German archaeologists discovered an altar that dated back to Lehi's time, with an inscription containing the name "NHM." As it turns out, if you travel east from Nehem you'll end up right on the coast, at a location that perfectly fits Nephi's description of Bountiful. The discovery of Nahom may be one of the strongest pieces of evidence we have for the Book of Mormon, but it is far from being the only one. Time and time again, the Book of Mormon has proven true to its claims. For more information, be sure to read our KnoWhy article on Nahom!